Friday morning I’m headed to my parents’ house for a few days there, most of which I think shall be spent making a Bûche de Noël! I tried making the meringues tonight at my house, but they didn’t really work out (I lack a mixer and metal bowls) so I’ll be making all the parts of the cake on Christmas Eve, then assembling it on Saturday for our big family dinner. I’ve started a new circle scarf in Malabrigo Twist for Christmas knitting, and I could not be happier with it – I LOVE IT. 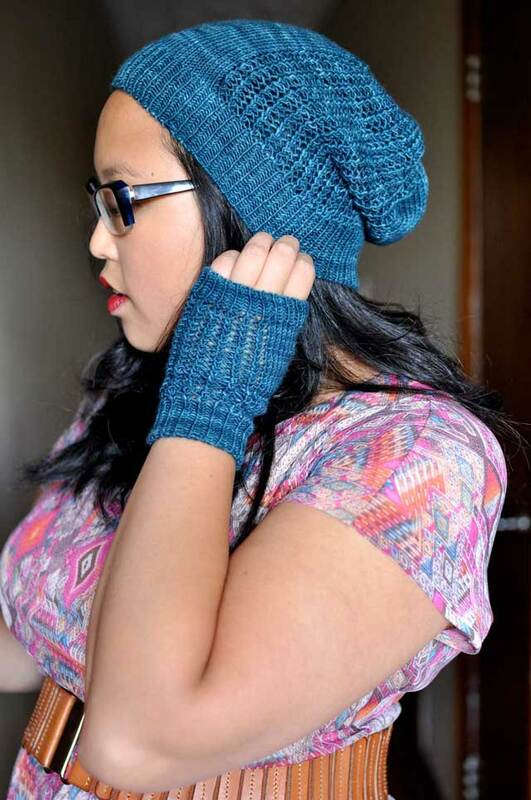 The yarn, the stitch, everything. I think it’s going to be pretty quick, too, since I’m knitting it on 5mm needles. Of course, what with all the baking, we’ll see if I get through the two balls of yarn I wound up this evening, ha. It’s getting pretty late to whip up a knitted gift, but homemade edibles are always appreciated! My caramel corn has been going over very well this year, and so I’m sharing the recipe with you all. Place butter, corn syrup, molasses and brown sugar in a medium saucepan and bring to a boil over medium heat. Boil for 5 minutes, swirling occasionally. Remove from heat and add baking soda, vanilla and salt – I like to use quite a bit of salt. Mix the syrup with the popcorn and peanuts, and any other mix-ins you’d like – other nuts, pretzels, whatever! I just eyeball it and pour some peanuts in. Don’t worry if it doesn’t look even, you’ll be able to spread the syrup around as it bakes. Spread the mixture onto baking sheets in a single layer. Bake, stirring every 15 minutes to distribute the caramel, for a total of 1 hour. Let cool on the pans. 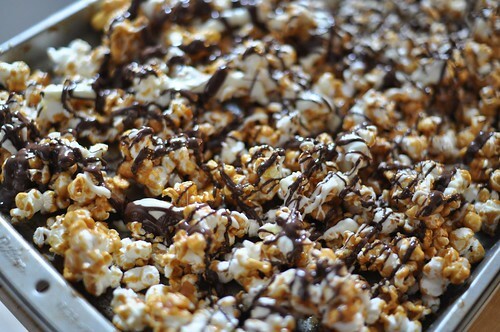 Melt chocolate one at a time in a double boiler or in the microwave and drizzle over the cooled popcorn. You may need to pop the sheets into the fridge for a few minutes to firm up the chocolate if you’re in a hurry. Store in an airtight container, but if you take it to a party there won’t be leftovers anyway! I hope you’re having fun this holiday and spending it in a happy place. Merry Christmas! I hope your holiday is going swimmingly. I just wanted to say thanks for posting this! I just made a batch to bring to a New Year’s party tomorrow, and I may have to make another, as it’s quite amazing!